The Pastoral Care program (TEAM program) at Mount Stromlo High School is designed to give each student and their family a teacher who is there to support them in their time at the school. This teacher is a contact for families and students to discuss attendance, academic and social issues and any other issue that may arise. Teachers meet with their pastoral care group (Short TEAM) for 10 minutes every morning for roll call and notices and for one hour every fortnight to deliver pastoral care sessions. Each Long TEAM unit consists of 5 one hour sessions per term. These are scheduled for period 3, Wednesday of Week A (11:30am-12:30pm). To establish and develop positive relationships between TEAM teachers and the students in their TEAM group. To provide closer monitoring of students with regard to school uniform, attendance and behaviour. For students to receive information about extra-curricular activities via the daily notices. Long TEAM is our school's pastoral care curriculum that specifically meets the needs of students as they progress through their high school education. The program explores various themes and focuses on the development of students as; a learner, a person, a community member and a contributor to society. Students at each year level have opportunities to address topics not generally covered in class e.g. bullying, resilience, Student Pathways, protective behaviours, wellbeing etc. NB Year 10 Peer Support Leaders mentor small groups of year 7 students in semester one and complete the long TEAM program as part of their Peer Support class. Pathways – Students look at their transition into and out of high school. This includes setting personal goals, exploring subject choices and study options, Work Experience, looking at plans for the future (including career aspirations) and completing a Student Pathways Plan. Mind, Body and Soul – Students explore topics to do with personal wellbeing and taking care of themselves and others. This includes looking at lifestyle choices, positive psychology, resilience and relationships. Protective Behaviours – Students explore ways to minimize harm towards themselves and others. This includes education about advocacy for safe practices around substances, social gatherings and use of technology. Communities – Students are encouraged to think beyond themselves and engage in ways to make a difference within the school and local communities. This includes connecting with the school community and looking at being an active community member and 'giving back'. 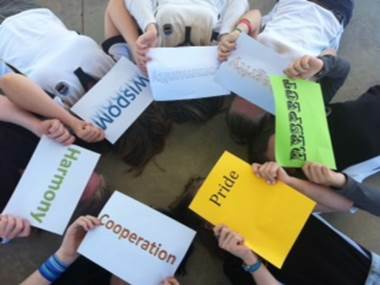 During Events Week in Term 1, all Year 9 students attend a two day training program to develop skills and learning in group dynamics, communication, quality relationships and working together. After this program all students are given the opportunity to put in an application to become a Peer Support Leader for the following year. This program is run with a Values Education focus. Students are invited to join this class in Semester 2. In Term 3, students learn how to facilitate a small group and gain essential knowledge and understandings about Values Education. During Term 4, the Year 9 students visit the South Weston Network Primary Schools to deliver sessions on the program to Year 5 and 6 students. Students, after being trained, put in an application and are selected to be Peer Support Leaders when they are in Year 10. This program runs in Semester 1 and leaders support Year 7 students in their transition into high school. Year 9 and 10 students can elect to do this course. Students are involved in a variety school and community projects. Students learn about the importance of volunteering and being a valued member of a community. The program also incorporates opportunities to tutor and work with younger students. Mount Stromlo High School has four school captains, Male School Captain, Female School Captain, Male Vice-Captain and Female Vice-Captain. Once elected the captains fulfil an important role; they attend SRC meetings and assist in decision making and fundraising initiatives. They present Captain's Awards – to recognise students who are demonstrating the school values and contributing to the Mount Stromlo community. They present a 'Captain's Report' at assemblies and attend many events and functions as ambassadors for the school. Students on the Student Representative Council (SRC) are a voice for their peers, student leaders in their year groups and representatives of Mount Stromlo High School. Students in Years 7-10 are given the opportunity to nominate themselves as a candidate for the Student Representative Council. Each year group then votes to elect its student representatives. The SRC meet regularly during each term to discuss issues that are going on around the school and in the community and to plan fundraising activities for various charities. The SRC also works with other local high schools (Melrose, Telopea and Alfred Deakin) to design and implement student initiatives on a range of topics impacting teenagers in today's society. There are many opportunities to be part of the House system, not only participating in carnivals and school sport but also in coaching and being House Captains.House Captains organize House Challenge activities at lunchtimes throughout the year, present 'The Sports Report' at assemblies and promote House pride. Students can also be involved in back of house operations and work as leaders in ensuring audio and visual presentations operate well at assemblies and other functions. Rotary Clubs involved with the school invite student nominations for their leadership program, RYPEN. RYPEN aims to provide young people aged 14 to 16 years with the opportunity to develop their leadership potential, alongside their peers in a supportive environment.